Ever feel bad about using those little plastic flossers or manual toothbrushes then throwing them away? We've found a solution: eco-friendly compostable floss picks and an eco-friendly toothbrush for easy, guilt-free dental care! Our natural eco flossers biodegrade in a compost facility within 180 days into organic soil - a little longer if you simply throw them in your home compost or garden. That's because they're made from renewable crops like corn and potatoes instead of petroleum, like name brand conventional flossers. 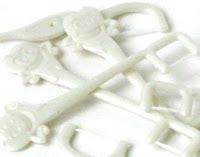 It took five years of development and consultation with dental professionals to come up with this truly environmentally sustainable product made of the new safe plastic option: bioplastic. Bioplastics are made from renewable, sustainable plant-based crops. Our eco-friendly flossers are made of starch-based resins from corn, wheat, tapioca and potato starches -- ecologically sound substitues for petroleum-based plastic products -- that come from primarily the Midwest (versus oil from the Middle East). Not only are these natural eco flossers free of potentially harmful chemicals like bisphenol-A (BPA) and phthalates, but they're fully certified biodegradable and compostable in the US and Europe. (Canada does not yet have certifications for biodegradability and compostability.) Unlike materials designated as biodegradable, those certified as compostable are designed to compost quickly, within 60-180 days, without releasing any toxic residues. 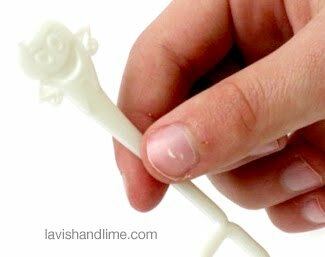 In terms of functionality and quality, our natural eco-friendly floss picks work just as well, if not better, than their conventional counterparts -- and the little 'Mr. Molar' character on the top of the kids' design is a favourite with little ones. The adult eco flossers feature a pointed end, ideal for cleaning specifics in between teeth. Complete your dental care with our eco-friendly toothbrushes for kids and adults -- also made from safe, sustainable and biodegradable bioplastic. Similar to conventional toothbrushes, our compostable eco-friendly toothbrush lasts about three months and the children's eco-friendly toothbrush is good for kids up to about 12 years. It's spring and a great time to rethink our old ways with fresh, new ideas. Why not feel good about cleaner teeth and a cleaner planet with effective dental products made from plants? 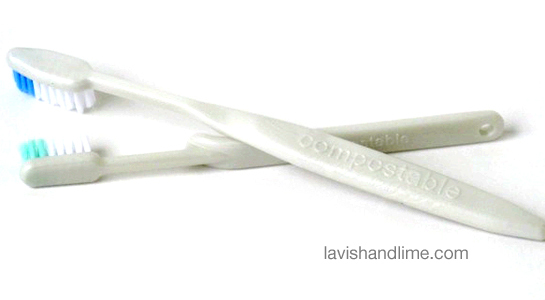 The eco-friendly flossers and compostable toothbrushes mentioned above are available at our eco boutique Lavish & Lime. If you have any thoughts or ideas about dental products or care, please leave a comment below. We'd love to hear from you! Great product - I love that they are biodegradable, and my 3 year old thinks they are a lot of fun to floss with. I would really really really really like to buy a few packages of these biodegradable flossers for my kids, but they are out of stock everywhere... here too? Why? Can you let me know who I can write to in support of their manufacture? It's a great product and I'm sorry I didn't buy a box when I last found them available! ...and Where are the adult floss picks?? Short and precise but very essential tips which people easily tend to forget. Well, but one shouldn't avoid seeing a dentist as well. It's been almost a year that i have been getting my treatment done from dentist Mumbai and I am happy with my healthy teeth.